Shrimp is the most popular shellfish in the United States and because of that demand, we import about 4 billion dollars worth of it every year from Asian shrimp farms. When I was growing up, shrimp were wild-caught from American waters...they were plentiful, less expensive and also had a better flavor. Wild-caught shrimp are still available today; be sure to check the package for source information. 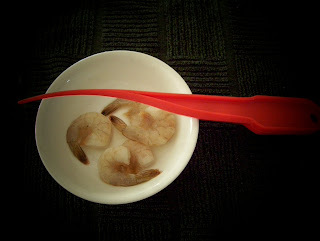 When I was a kid, if shrimp was on our dinner menu, I always seemed to wind up with the job of removing the shells and the sand veins.The shrimp were icy cold and slippery and while the red plastic tool helped with the shell removal, it was a time -consuming and thankless job. In today's world, shrimp sold with the shell on will often have the top shell-line removed and also the vein. This eliminates the need for the shrimp tool...just pull away the remaining shell with your fingers. The sand vein, by the way, is not really a vein, it is part of the digestive tract and contains...sand and other gritty particles. People all over the world have their favorite shrimp dishes and fix them every possible way: fried, grilled, barbecued, stir-fried...with coconut or garlic...in sushi, as a bisque, ettoufe, gumbo or creole...tempura battered or plain for shrimp cocktail. One of my favorite shrimp dishes is scampi. You might have to be careful how you order that dish, though...scampi can mean something completely different depending on regional peculiarities...to some, it is the menu name of shrimp; to others, it refers to a method of preparing shrimp. In the United Kingdom, scampi has nothing to do with shrimp at all...instead it refers to a dish of deep fried lobster. After reviewing 50 or 60 shrimp scampi recipes, I discovered that none were like my mother's. I don't know where her recipe came from, perhaps she made it up...nevertheless, I love it. Shell and de-vein shrimp, rinse and place on paper towels to dry slightly. Heat a large pan on med-high heat. Add equal parts butter and oil and heat until butter is just melted. Toss in shrimp and stir it around to cook evenly. It will lose its transparency. When almost done, add garlic and bread crumbs. Continue to stir and have all the shrimp well coated with buttery crumbs. Add more butter if necessary. Do not let crumbs burn. Remove pan from burner immediately, when shrimp is done...do not overcook shrimp. 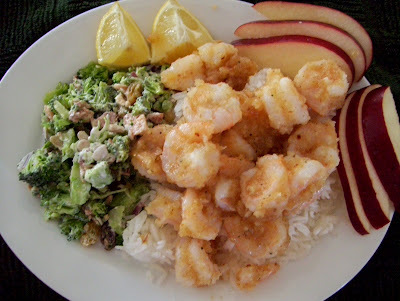 Transfer shrimp with crumbs and garlic to serving plates and add a wedge or two lemon to each plate. Note: You will notice that most ingredients do not include measured amounts...this recipe is all done by taste and quantity. For four servings, I would probably use 2 cloves of crushed garlic...and 1 C of good bread crumbs. Side dish suggestions: Basmati rice, pea pods, fresh fruit, baby peas, spinach. Salad recipe: The side dish in the picture above, is broccoli salad, post #29. Marian wrote: I really love shrimp. However, I never order shrimp scampi because of the garlic. I think your recipe would be just perfect without the garlic. Kenda wrote: Your food blog continues to look fabulous!